"I always want Virtual Console SNES titles to be in native resolution and it's finally here on Wii U"
The quote above is a comment I wrote on Miiverse, which over 15 Miis enthusiastically agreed on that statement. 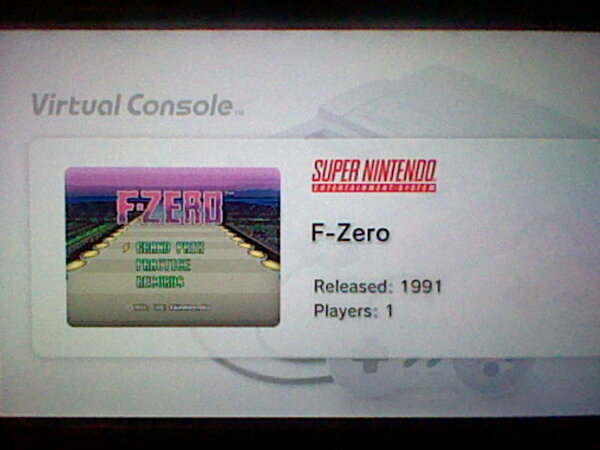 With the improve emulation in a true aspect ratio 3:4, F-Zero visually surprises me that this was a SNES launch title. F-Zero is a future, high-speed, racer. The goal is to survive all 5 laps and try to successfully reach the goal in first place on all 5 courses in a cup. There are only 4 levitating vehicles with different strengths and weaknesses to choose from, 3 cups, and 3 difficulty settings (selecting others by pressing down when Beginner is highlighted). This is no cakewalk, or cake hover, as there are a handful of tricky cornering maneuvers during the later courses on the first cup. While the game is mostly unfair due to aggressive AI pushing you and prosy obstacles of aimless vehicles that have no business being here, the Wii U version does have multiple solutions to make the experience more acceptable (at least in low difficulty) and more fun. Miiverse is a great addition to Virtual Console with trends of the similar personal urgency and advices (as well as failures via screenshots) from Wii U owners who are playing the same classic game at the same modern time. The most common issue posted on Miiverse involves White Land II, the course with a huge jump gap that is mandatory. The solution is to hold down during the jump, making the jump last longer for which the game’s digital manual failed to mention. The other welcoming feature is the Virtual Console menu (touch the GamePad screen) that includes the Restore Point and remapping the controls to your liking. As I mention before, F-Zero really demonstrates that SNES Virtual Console titles can actually be brightly polish on a widescreen HD screen. Unfortunately, viewing the action on the GamePad screen is as bitter presentation wise as playing SNES titles on the Wii’s Virtual Console. The pixel colors are flat and there’s even a graphical glitch, sometimes extra pixels spewing out to the right black border. 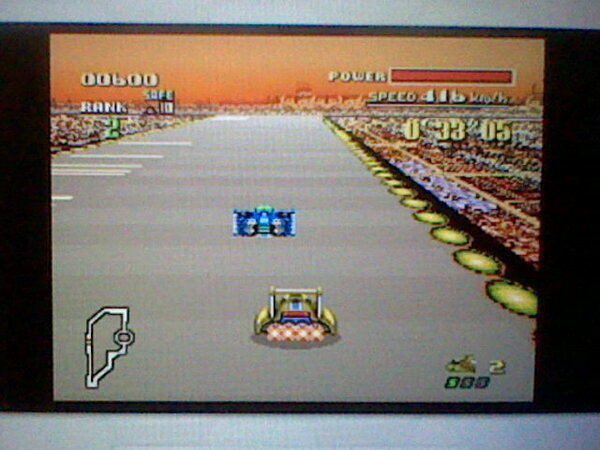 F-Zero on the Wii U is a great first impression for future SNES titles on the new Virtual Console service. The game itself, however, is not as great in the end. There’s no real reward in accomplishing the later difficulty, unless you count as unlocking the Master difficulty as a reward. There are no new vehicles or new tracks to unlock. Recommended for those who love the latest F-Zero games and wanted to listen to the familiar adrenaline soundtrack in 16-bit. For those who are interested in witnessing the improve emulation and doesn’t want to wait for the next SNES arrival (Super Metroid), then investing F-Zero on a special 30¢ price tag is not bad at all. Wow this is a very well written review dude. Very beautiful review,s but KingreX32 why is your message field a different color than normal? Actually wouldn't more SNES games come to VC during the April update? it's just Super Metroid is the next .30 one. Kushina wrote: Very beautiful review,s but KingreX32 why is your message field a different color than normal? Ive got no idea. Kushina please visit this topic. I think that's the only SNES title coming until then. It's because the TC thanked him. I think I'm going to continue posting my Miiverse comment above future Wii U reviews. Overall thoughts about the game in 100 characters or least. @SkywardL wrote: I think I'm going to continue posting my Miiverse comment above future Wii U reviews.